It was a grey morning leaving ..San Francisco. A still, grey morning. The plane was delayed 2 hours and I didn't care. It wasn't a cool, laudable, Zen-like patience, but rather a kind-of cumulative numbness that's been building up for the last few months. 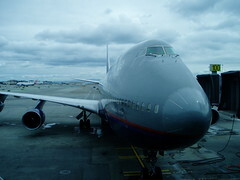 Probably since my last trip to Japan… Since that time, life has been harder than usual. The economy has tanked, the social, political, and economic uncertainties in America are taking their toll – individually and collectively, I think. Normally, it "hits me" a week or two before I go – "I'm really going to Japan." And yet, as I sit here in seat number 36C, I still don't believe it. It's just a really crowded restaurant with bad food and an annoying white noise that drowns out conversation. It feels like the turning of a page, a closing of a chapter in my life, punctuated by this trip. The new chapter that I can feel wanting to emerge is as yet unknown to me. But strangely, I can feel it just the same. Maybe that's why this trip feels different than any of the last 7 trips to Japan – it feels like just the punctuation mark between chapters, whereas in the past, it was the chapter itself. But that's what I've been craving, I think. Rather than this endless stream of word, like a Ginsberg poem, I've craved "punctuation" in life – periods – to stop and take in what just happened, and prepare for what's to come next; Commas – that give just enough pause to breathe, to savor the moment in the midst of the chaos. And exclamation marks! Certainly, I've had way too few of them in my life lately…J So, here's to…life! 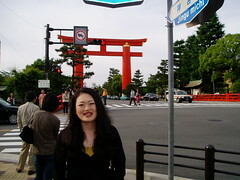 a huge Shinto Shrine of great historical and spiritual significance for the Japanese. 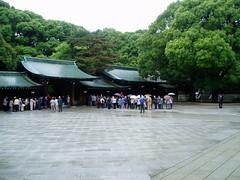 The Emperor Meiji and his wife are enshrined here. He was credited with bringing western 'modernity' to Japan (for better or worse...) back in the late 1800's. 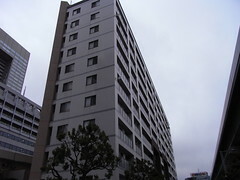 Just a mile from there, lies trendy, bustling Omotesando. My friend Kana san owns a chic cafe there, Cafe de Pou, and I stopped in to have lunch and catch up with this rare, exceptional woman. 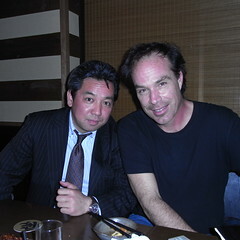 ... ..
From there, I return to my hotel to meet with a real estate agent/friend named Suke san. DAY3 - Live show in Asaga Ya. In a western suburb of Tokyo named Asaga Ya, there's a great little nightclub called "Next Sunday." 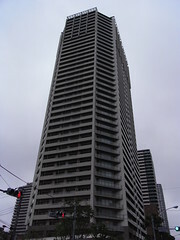 It is owned by Miyako san, and her assistant is named Sayo san. Her favorite three musicians are Bob Dylan, John Lennon, and Neil Young. Although I've played my usual original show there before, I suggested we do a "Bob, John, and Neil Tribute Show" for her - playing only music from those three. Well, it was a blast! And although we didn't stick to a strict diet of just those three, it was a great, and rare chance for me to play some of my favorite music. 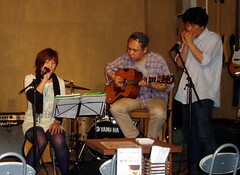 And people were great, I played solo, and with my great friends Hiro san, and Okano san, and there were other musicians that did some really beautiful, moving songs. It was a great opportunity to promote the scholarships that my NPO hashi.org is giving out right now, and the club passed out flyers that I'd made with the info. And Miyako san was such the consummate hostess, she made me 8 or 10 copies of CDs of Japanese musicians she thought I'd like, and had her sound man videotape and record the show for me, and, in a humbling display of traditional Japanese etiquette, gave me a hand-written letter of thanks. Afterwards I went out to dinner at an awesome restaurant that was billed as a vegetarian restaurant, but had ample beef and pork on the menue... I learned from Kana san not to leave rice uneaten on the plate, because Japanese believe that 7 gods reside on each grain of rice, and to leave even a spoonful...imagine abandoning like 300 or 400 gods for my carelessness! From there we ducked into a nearby Karaoke place for an hour or so of unrestrained debauchery... I have to give credit to my vocal coach - April Diamond- I sang for maybe an hour and a half at the show, and then belted out another bunch of burners at Karaoke, and still had a voice left. What a great night. I've written before about the joys of taking the Shinkansen (bullet train) from Tokyo to Kyoto, but it's such a pleasure, it's worthyof mention again. A 2 1/2 hour smoooooth ride in roomy, comforable seats, great scenery, and by all means, a great time to enjoy a "bento box" lunch and tea. The weather was perfect as we arrived in Kyoto, and after checking into the hotel, I met my friend Satomi san, and went to a very special performance of Noh - traditional Japanese musical plays. This series of four plays was put together as part of a year-long celebration of the 1000 year anniversary of the "Genji Monogatari" (The Tale of Genji), considered to be the world's oldest novel. As it happens, I've been reading it lately (1,100 pages! ), and even though the words and lyrics are in traditional Japanese, there was an English synopsis handout available that made it all come to life for me. As I sat in the early-summer evening amongst thousands of eager Japanese, surrounded by the towering, timeless Heian Shrine temple buildings, the sun goes down and there's a firelighting ceremony, and the fires are tended throughout the play to add to the minimal stage lighting for the plays. 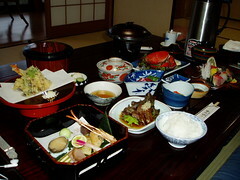 Afterwards, we went to a great restaurant on Kawaramachi and enjoyed a traditional Kyoto-style (Kaiseki ryouri) feast. Monday was a rainy day in Kyoto. A warm, early summer rain. 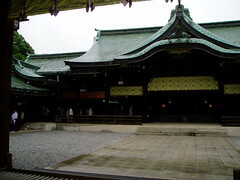 I started out the day with a trip to Chion-in Temple, my favorite in Kyoto. It's my favorite for the way it makes me feel when I'm there - no other reason. I first learned about it on New Years Eve, when they have a famous bell-ringing ceremony that I've seen on the International TV channel in San Francisco. .. I go into the main temple building (hondo) and sit and take in the stillness, the smell, the monks chanting, drumming, and ringing of the beautiful large bells. It's a mixure of prayer and meditation, but in truth it's really reaching the "no-mind" state that brings me to tears. Tears of joy, beauty, sadness. I'd arranged to spend the day with Tomoko san, who I'd met 2 years ago when I went to the JAS Convention at the Kyoto International Conference Center. She is a professional tourguide, a life-long Kyoto native, a wealth of historical facts and stories, a gracious woman, and happily for me, a great friend. Her English is also the best I've ever heard from a Japanese living in Japan. Although I promised not to let her be a "touguide" on her day off, our conversations invariably weaved in and out of Kyoto and Japanese history, literature, geography, et al. 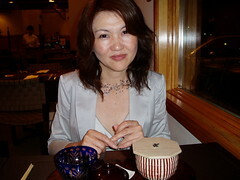 She indulged me in my request to have dinner at a renowned Kyoto "yuba" restaurant. 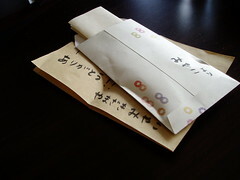 – "Yubasen"
I hand out a few hashi.org scholarship announcement cards, and every once in a while, a free CD to some of the people I meet along way. Again, a little rainy, but as it happens, much of Kyoto's central downtown district has covered sidewalks, shopping areas, train and subway stations, and public spaces. Since rain is part of life there for part of the year, they've done well in not letting it slow them down. 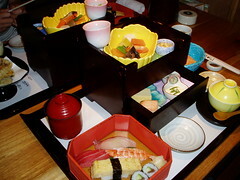 We have lunch a fabulous traditional Japanese restaurant at, of all places, Kyoto train station. of the restaurant after the chapters of the 'Tales of Genji" book I mentioned earlier, and having the book handy, we thumb through the chapters matching the English names to their Japanese namesakes. After a delicious traditional Kaiseki lunch they serve a 'mochi' (a sweet, gummy, pounded rice outside with sweet red bean paste inside) that is specially served only at this time of summer. 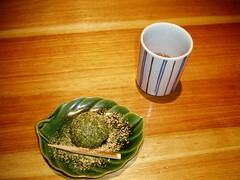 The green outside comes from a particular type of grass that's powdered and mixed with the mochi. OHMIGOD it's so good! Then it's back on the Shinkansen and eventually to Shinjuku for one last night in Tokyo. It's amazing how much one can fit into life when motivated to do so. Like these trips, when I return to America and look back, I can scarce believe that I was fortunate enough to have been the places I've been, seen the things I've seen, with the people that I've met – new friends and old. The last night always seems like a microcosm of that theory – trying to fit as much in as I can for one last time. 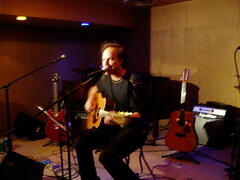 Hiro san called and invited me to a show just around the corner at a place called "La Dolce Vita." And Lihn, my film director/software engineer friend invited me out for dinner. 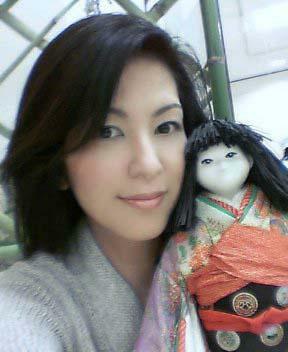 But I had plans with my friend of 3 years, Kaoruko san. 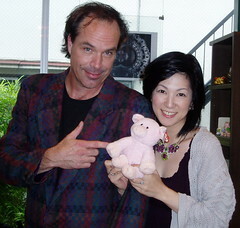 So, 2 out of 3 aint' bad… I had a delightful visit with Kaoruko san in Shinjuku.. In addition to her "day job" she dances with the ballet in Tokyo Although she speaks very little English we were able to spend 2 or 3 hours together conversing in Japanese on everything from family, work, the economy, our thoughts on the past, and our dreams for the future. 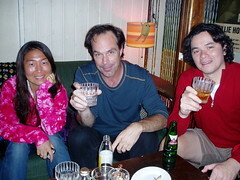 Then on to Shimokitazawa, a cool, rustic hodge-podge neighborhood on the west side of Tokyo to meet Lihn and his wife Yukako san for a late dinner. Lihn has shot documentaries, worked for Saturday Night Live, among other things, and now works for Cisco Systems, doing music and film projects on the side. Yukako san is working for a company that makes and installs solar panels, and our conversation about the (some say 'long-overdue') "greening" of Japan – with new laws and incentives for people and companies to move towards energy efficiency, recycling, etc. We talked about hashi.org and the scholarships, and again had a few opportunities to hand out some brochures and 'spread the word.' After 2am, I finally had to bid 'mata ne' (see you again) and say goodnight. After a leisurely morning, I stop at the local flower shop and have a bouquet put together and take a taxi back to Omotesando to say goodbye to Kana at her Café. With a promise to each other to meet again soon, she sees me off in a Taxi. I pick up my luggage at the hotel, and catch the Narita Express Train at a nearby train station to Narita Airport. Watching Japan breeze by my window, first through Tokyo, then the suburbs, then the green fields and forests that we pass on the way "home," I'm thinking that with everything I did this past week, and staying out late last night, I should be tired. But I'm not. I'm wide awake. Wide awake. It's hard to believe that it was just a week ago that I was sitting a few rows over in a 747 just like this thinking about how I've been sleepwalking through my life. But life is like that. In hindsight, we think how naïve, how un-evolved we were in the past compared to 'now', only to then grow some more and realize again that we still had a long way to go. It hit me this week. Not up here (brain) but here (heart) that in my life – with friends, family, people in general, and lacking a 'significant other,' that I've not allowed love in my life for quite some time. I've jam-packed my life so full that there has been no room for it. And I realized that I want that again. And I also realize that it's not like just turning a switch on or off. It starts with intention, then action, and little by little, it starts to happen. And I would hope that in that process, I remain "awake" – not sleepwalking through life again. Anna Pham the pictures are awesome.. did u take these?? Xtina Awww, this brings back good memories and really makes me want to go back to Japan too. Can't believe it's been a year since we've been there. How time flies. Thanks for sharing your trip with us! Joanne™ I am very happy that you are having such a beautiful trip. Too bad you can't stay longer, you deserve it...Sounds like you are having a good relaxing time with lots of life, love and happiness which you deserve. AWESOME...a little bit of santa cruz for you ..haha..
Michael J Downey Lynne, thanks for your sweet comment. You know, it's double-hard for me with the trains, because I never use them in America (except for New York subways). So, it's both the language challenge, and just knowing how mass-transportation works! :) And about the condo, there will be a property management company, plus, I'm lucky to have friends that have offered their help in finding one and taking care of one once I get it. 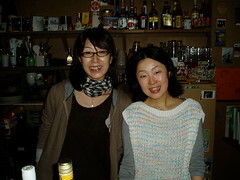 hiro/Sola Thank you last night. In the days of the teens, I remembered time when I played with a friend in a music studio.